Don’t Waste Your Money™ is a E.W. Scripps owned property and born out of the desire to give you the facts and information needed to make the best buying decisions for you and your family. 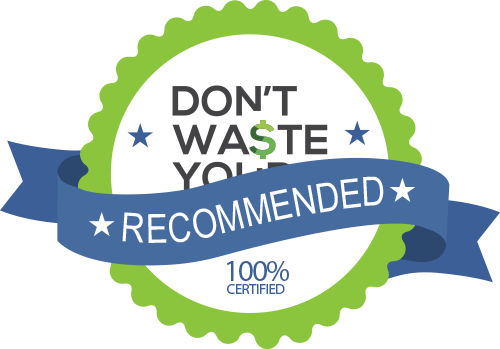 John Matarese started Don’t Waste Your Money in 1999 and over the past 20 years has helped millions of consumers by providing in depth research and product information. At our very core, we are journalists. It runs in our blood to investigate, uncover truths and share. We relish in giving you the chops to confidently get amazing products and services at great deals and avoid scams and budget pitfalls through our advocacy, advice and expertise. Ultimately, we want to help make your buying, spending and saving moments more inspired and budget-friendly. We promise to put our investigative know-how to very good use, so you don’t waste your money. With hundreds of websites providing reviews on products, it can be overwhelming to know where to go and who to trust when you’re trying to determine the best product to buy. It’s awesome that so many websites are reviewing products and when you combine all these reviews together, the absolute best products will rise to the top. That’s where DWYM Reviews comes in. Our team of product geeks do our own product reviews but all pull together reviews from all the top sites across the internet. We then create a score that “melts” together our own reviews along with ratings and recommendations from other trusted sites. The result is the DWYM Review Score, which is a 1-10 rating that takes into account what all the websites said about a specific product. Our score gives a higher weight to leading and trusted sites, but we also include small blogs and niche sites that specialize in a specific category. In addition to website expert reviews, we pull in the ratings of actual other consumers. Those ratings get blended into the score, too. The result is an unbiased rating for the product you want to purchase. The more experts and consumers that recommend a product, the higher its DWYM Review Score. Keep in mind, a product can be both the Best Overall and Best Bang For Your Buck. Our goal is to make the DWYM Review Score a valuable tool to make sure you are buying the best product to suit your needs. If you’re like a lot people, there just isn’t time in the day to spend hours researching which product to buy. DWYM Reviews tries to make things simple. Just look for the DWYM Review seal for products that you can trust to purchase. These products have been universally praised by the most trusted experts along with thousands of users. We feel confident that you can’t go wrong with one of these products. We have a team of more than 20 research geeks who love products. This team spends thousands of hours researching products to help you find the absolute best choice.